While at a soccer game some time ago I was reminded of why there is so little peace in our world. Parents from the two opposing teams almost came to blows and bloodshed while watching from the bleachers. This wasn’t a game with the World Cup at stake. These were five-year-olds on the field. Cooler heads ultimately prevailed, but only after copious amounts of pushing and shoving, after the air had been singed blue with profanity, and the threat of involving law enforcement was made. It made me wonder what these five-year-old witnesses had to say after the game as the juice boxes and orange slices were passed out. The Hebrew word for anger literally means to “blow out your nostrils” or to “smoke.” That’s apropos, for we all know what it is like to get that fire burning and boiling on the inside, only to have it explode out the chimney of our mouths, minds, and fists. Truly, few things have the incendiary power of anger let off the leash. How much pain has anger caused each of us by fueling words that can never be recalled, actions that can never be undone, and memories that can never be erased? How many divorces, wars, irreconcilable differences, failed business partnerships, murders, errant texts and emails, and soccer field assaults have been the result of primal, fully vented rage? 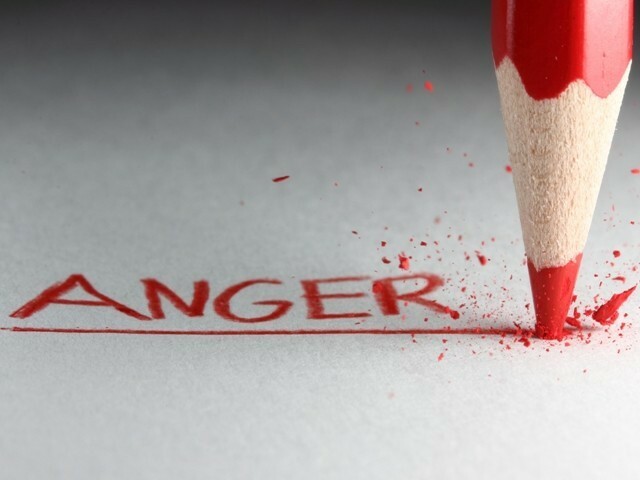 We know the painful answer to these questions, but we may not have considered the answer to this question: Why does anger seem to get the best of us? I have three young men in my home with lots of testosterone coursing through their veins. Somebody is jack-slapping mad most every day, and I often ask, “Why are you so angry?” My children never give me a straight answer to that question. Oh, I get an answer; it usually involves finger-pointing with artery-and-eye-bulging blame toward another person. Yet, other people are not the source of our personal anger. They play a role, certainly, but the source of anger is usually internal, not external. Now, is there such a thing as justifiable anger? Yes. Is there anger that is right and just? Absolutely. But genuine “righteous indignation” is a rarity. The anger that most often consumes us is the anger of offense. We feel insulted, disrespected, or that our rights have somehow been dishonored. Our rage is rather self-centered, the result of others not doing what we want or expect them to do. I have a hunch that most of our anger stems from a lack of maturity. See, we move from childhood to adolescence and adulthood when we realize the world does not revolve around us. It’s no wonder the teenage years are full of such rage and angst. In addition to puberty, galloping hormones, changing bodies and changing family relationships, there is this social coming of age that informs us we are not the center of the universe. Some of us have had our growth stunted at precisely this stage. We are stuck in an adolescent state of immaturity and perpetual offense. This is as equally true of soccer moms and little league dads as it is of war-makers and politicians. We want everything and everybody to orbit around our shining sun, to do and behave as we demand. Frankly, this is a formula for frustration, for it demands of others and the world what cannot be given. So how do we calm the burning fire within us? Well, we can control everything and everybody around us, forcing them to comply with our will (Let me know how that works out for you), or we can grow up. Francois de Fenelon said it simply: “The moment you stop wanting everything your way, you will be mature. Until then, your life will be full of trouble and agitation.” We don’t have to live with this kind of anger. We can let go of our pride and self-centeredness, and release our grip on our always defended rights. We can learn to let go, and thus, learn to grow up.